“Giving, compassion and kindess,” — are three words Christine (Kinslow) Carroll used in connection to her efforts to make the world a better place. Carroll, a 2001 Manor College graduate with a resume filled with service outreach, and local and global volunteerism, is living out the service mission of Manor College. Carroll received two associate degrees from Manor College, one in Allied Health, Pre-Nursing and another in Healthcare Business Administration. Following her time at Manor, Carroll continued her education and received a Bachelor’s of Science degree in Nursing from Dixon School of Abington Hospital. As a nursing student, Carroll organized a medical service trip to Costa Rica through International Service Learning with her classmates. Carroll acted as group leader by recruiting nurses, organizing airfare, collecting paperwork and helping raise funds for the cause. The trip lasted 10 days and students came equipped with medicine, food, vitamins and other essentials for villagers to use. 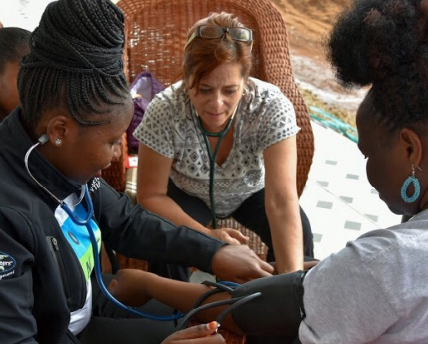 Since then, Carroll has organized two more medical mission trips, one to Belize, and another more recently in 2018, to Tanzania, Africa. “Ever since I went on the first trip, I feel like it’s where I need to be. I find so much joy in it, it’s easy for me. I love being there,” said Carroll. “I don’t have my cell phone, I don’t have TV, and it’s just kind of back to the basics with people and helping them. It feels very rewarding to me,” she adds. In Belize, Carroll was joined by seven other helping hands. Together they served over 200 people with medical needs. The medical staff setup clinics during their 10-day stay, in addition to making house calls and visiting schools to teach lessons on proper hygiene and sanitation. 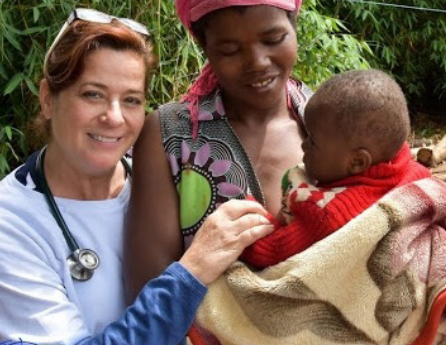 Carroll’s most recent trip to Tanzania was her longest– the trip lasted for 17 days. Carroll explains that this trip had its hardships, the two biggest being the distance and how primitive the area was. “I can’t believe that people in our world live like this. They have limited or no resources, and you would never believe it unless you’ve seen it. It’s culture shock,” said Carroll. Carroll is the Director of Nursing at Visiting Angels, Living Assistance Services in Jenkintown, Pennsylvania. Carroll is one of 15 children and explains that her family always encouraged giving back– which is where her drive to help and serve comes from. “Out of nine sisters, five are nurses and four are teachers, we are all in the field of caring and helping others. It’s in our blood,” said Carroll.